Standing beside his two little daughters, who were playing amongst the debris and building material, Mohammed told me how grateful he was that he can now plant olive trees, beans and chickpeas, which he will sell at the market. He is also building back his house. The story was similar for grandfather Tuw Feq El Qarraa who lost his means of making a living when his olive orchard was destroyed. 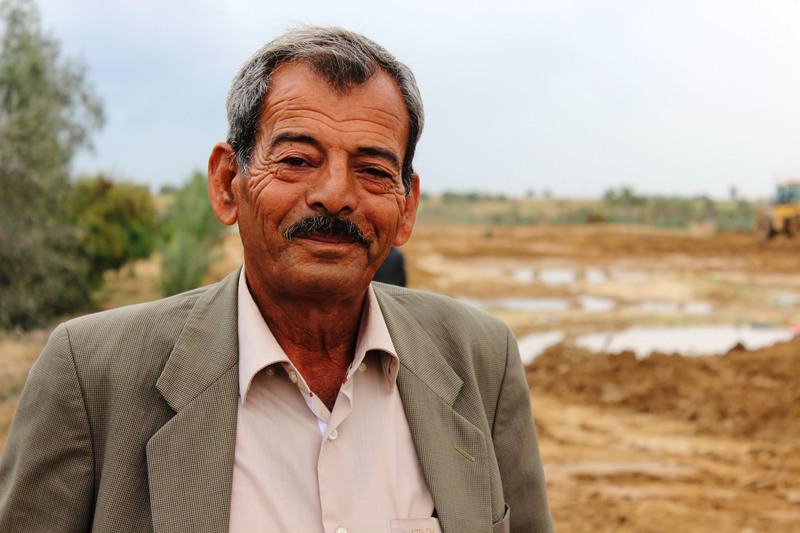 He received support from CAFOD to help remove the rubble from his land and restart his business selling olives. Aid agencies always talk about making people more resilient – but what does this really mean? It means having the ability to bounce back, to cope and recover from shocks, disruption and loss. As relief and development agencies we have a role to play in helping both individuals and communities to recover, and to reduce people’s exposure to risk. And yet, in a situation such as Gaza, the reality is that regardless of our efforts, we cannot remove the ultimate risk of insecurity, and this has a huge impact on people’s wellbeing. She knows that, despite the ceasefire, peace is fragile. Heyam lost her husband five years ago and during the summer had to evacuate her house three times as rockets fell. CAFOD has been supporting Heyam and her family by providing water filters so that Heyam can have clean water at home for her family to drink. Heyam explained that before “her house was a shell” and it was hard for her to get clean water nearby, but piece by piece Heyam’s house feels more like a home. So what can we do? We can stand in solidarity with the vulnerable and provide practical means to help people face life’s difficulties, so at the least they can survive and at most, thrive. Things like water filters may seem like a small addition to a home, but they have a big impact on quality of life. It is a sad fact of war that those who suffer the most are the vulnerable. Over 500 children were killed during the summer months, countless were injured, and places of safety such as schools and kindergartens were also damaged or destroyed. I visited one of the kindergartens which are being rehabilitated under a CAFOD-funded initiative. Jamila has devoted her life to helping children. 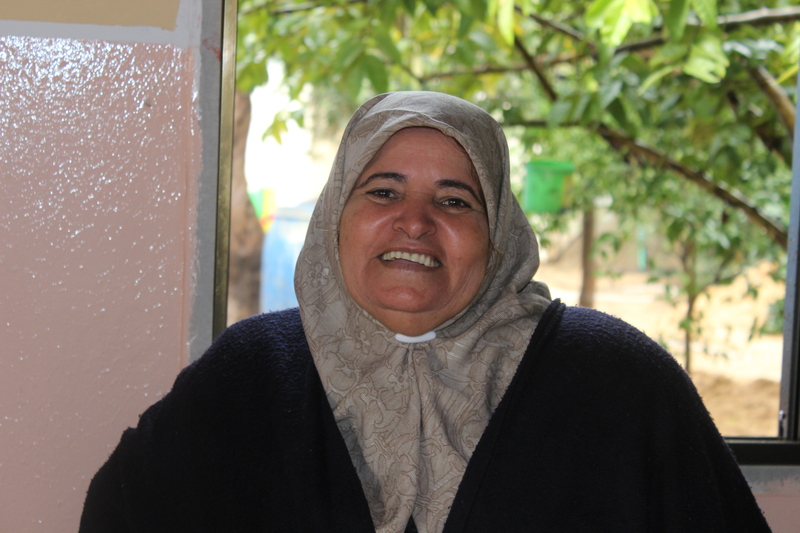 Jamila, a motherly figure with a gentle presence and sincere smile, greeted me at the door. She started this kindergarten 26 years ago and has devoted her life to children. She has seen two generations of children come through her doors and noted to me how in her life experience it is harder today to be a child than ever before. Insecurity abounds and the hope for employment in the future is uncertain. Yet for now, she is determined to make life better for the children who come through her doors. She chuckled as she described how some children hide at the end of the day because they want to stay and play. This, she said, is the first time in 26 years that anyone has recognised her efforts and given her support. Her sincere and heartfelt thanks made me realise that in the midst of such destruction, we should continue to do what we can. It really does make a difference. Claire Grant is an Emergency Response Officer in CAFOD’s Humanitarian team. From my recollection the IDF blockaded Gaza and did the damage by bombing and shelling both oof which were carefully targeted to the best of the IDF ability. So how did the olive grove come to be destroyed? The only thing I can think was that this was an area where the tunnels into either Israel or Egypt were located. If so it puts an entirely different perspective on the destruction and it would have helped if your blog had been more accurate on such an important factor. Hostilities resulted in substantial damage to Gaza’s farmers with destruction of farmhouses, agricultural land, animals and crops as well as agricultural infrastructure such as greenhouses and irrigation systems. Tuw Feq El Qaarraa’s olive grove is in the Khan Younis area, central Gaza strip, an area which bore the brunt of the Israeli land offensive. CAFOD staff can testify to vast areas of levelled land and swathes of destroyed buildings resulting from aerial bombardment and ground incursions. But just to be clear – as an aid agency, our priority is to deliver aid to those most in need, regardless of race, religion or politics. We condemn violence against civilians by all sides (including both Hamas rocket fire and Israeli military action) and, during the conflict, we called for all sides to adhere to international humanitarian law. We continue to pray for a just and lasting peace.